Today is National Quilting Day. I am going to post about making the “Sixties Blues” quilt. About 1975, when I was pregnant with my 3rd daughter, I decided to make a quilt. I have a box of African fabric scrapes that I used. 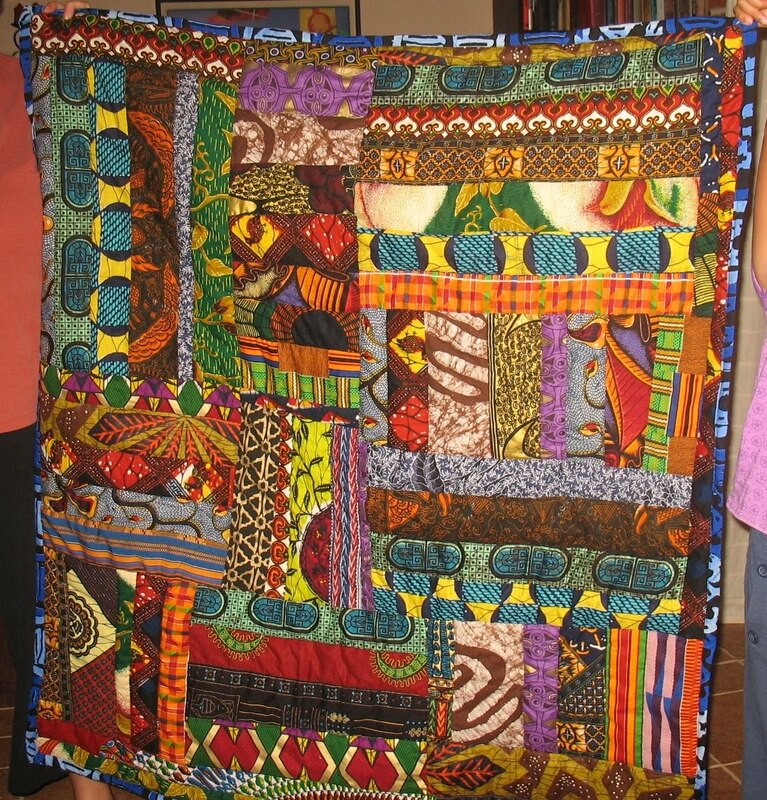 As the years went by and more babies came along, mine and those of friends, I made many African fabric patchwork quilts. Sometimes I had a pattern but usually I just put the fabric together however it moved me. Here is one I made for my granddaughter Kylett several years ago. In 2008 I took a Photo-quilting class. Over the years, I had made patchwork quilts but had no idea there were methods to square up the corners and other fine points I never learned because I was making it up as I went along. It took me much of this 8 week class to design my first photo quilt, sew the top together and baste the three layers (top, fill and backing) together. 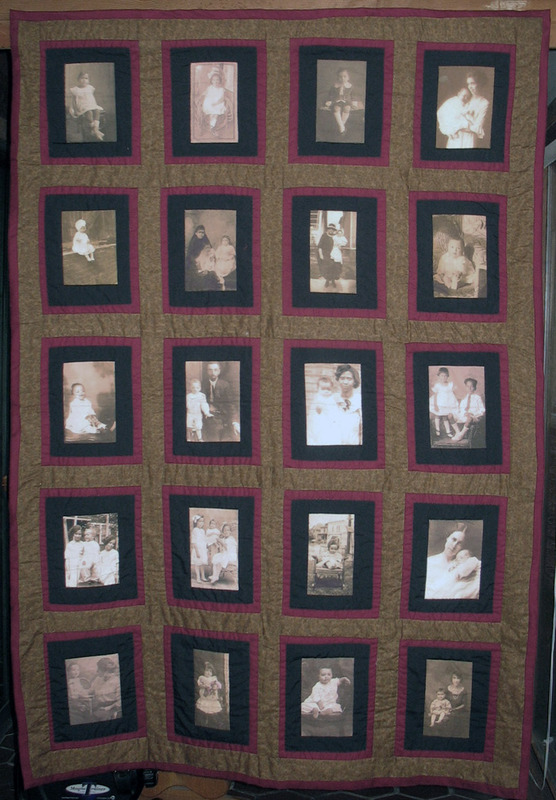 This is my Ancestor baby quilt using pictures of family babies from the early 1900′ to the 1920s. At this same time I was getting back into printmaking. My major in college was printmaking but once I graduated, I ended up living various rural areas and I did not have access to the supplies and equipment I needed until we moved to Atlanta four years ago. where I took a class, in printmaking to refresh my mind after a 40 year break. After that semester ended, I decided to continue with the printmaking and put the quilt on the back burner. For three years. This fall I decided to take another quilting class to force myself to finish the baby quilt. I didn’t quite finish in the first 8 weeks so I signed up for the next eight weeks and FINALLY completed the quilt, which I will put in the Annual Southwest Atlanta Art Center. I decided to do the “Challenge quilt” for the show held each spring at Southwest Atlanta Arts Center. 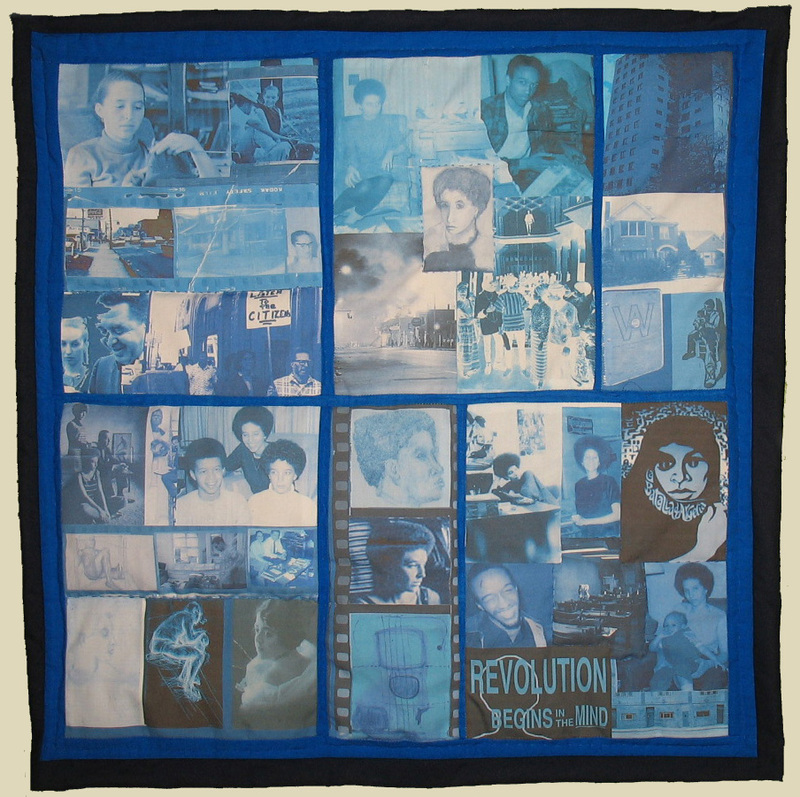 For each show there is a “challenge quilt” that participants can do or not. This year it can be no larger than 24 X 24 inches and has to be all one color, including the thread. I decided to do one about the years of my life from 1966 to 1969. Although there were high points to those years, there were also some depressing times so I chose blue for the color. I have been making collages for all of my adult life. I have done a collage on the wall in most of the houses we lived in over the last 40 years. I decided to do this quilt much like a collage. 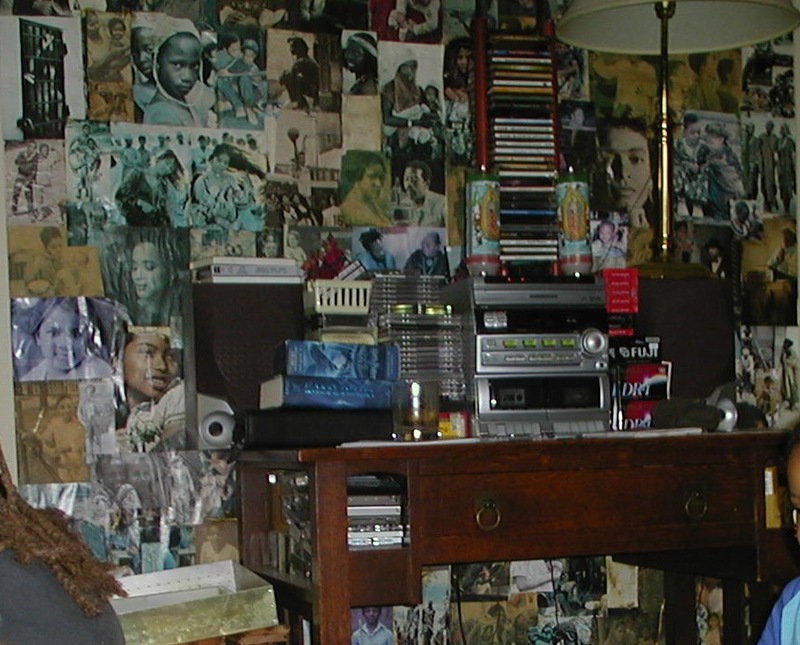 Wall collage in my front room - Idlewild, Michigan 1998. 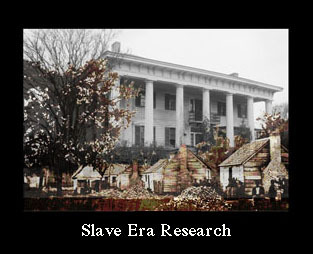 I have plenty of photographs from that period. I chose the ones I wanted to use, scanned them and used photoshop to fix them if they needed it, resized them and turned them blue. I inverted several so that they look like negatives. I printed the photographs on Jacquard cotton squares, 8.5 x 11 inch cotton sheets with a removable backing. (I’m not being paid by Jacquard). I made 5 squares, 8 x 10.5 inches, two and a half on top and two and a half on the bottom. I used one square for each year, give or take a bit. I arranged them much the same as I would for a collage on a wall using various sizes and shapes, over laping when I liked the look of it. There are some light spots that I am going to color in with blue pencil to be within the guidelines. After I finished that one, I decided I like to work small and quickly made a smaller quilt which I wanted to look like the album pages that the original photographs were on. Then my grandaughter came to visit during her spring break and I didn’t get any more quilting done. She returned home today and I’m thinking about my next quilt. The next session starts next week and the show opens April 29 at Southwest Art Center and stays up about a month if you are going to be in Atlanta, drop by. For other Sepia Saturday photos go here. That is really interesting how you combine the two mediums into one. I love the baby quilt. Do you somehow print onto the fabric? I'd love something like that. Stunning work. That first one is so magical with patterns and colors. Very earthy. The ones with the images look like windows. Almost like an advent calendar. Your quilts are lovely. The first is so bright and lively with color. I especially like the last quilt, the "album" quilt. How will you quilt it, or will you? Will you stitch around the people, around the borders of the blocks, or…? Oh my goodness beauty beyond words! Thanks so much! I can't imagine how you have the patience o the time to complete work like this. So detailed. Fascinating. I don't think I had ever heard of photo quilting until you mentioned it the other week. Thanks so much for the detailed and fascinating explanation. Thanks so for the explanation. It almost seems achievable – except for my stunning lack of focus. Your quilts are superb, absolutely superb. Who, I print on the fabric squares with my usual printer. Nancy, I quilted between the photos. If you enlarge the photo twice you will see the (ack) crooked stitches, black on black. Bob, that is why I am working small now and also why I am thinking of new ways to do the actual quilting so that it isn't just around the outside of the photos. i'd like to do one where the stitching is a part of the whole. Nolichunky, you could start very very small. The quilts are wonderful..and I really love the wall collage! Wow! 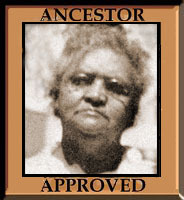 What a fun and unique way to show off your ancestors! The wall collage is especially nice! The only problem with the wall collages is that i had to leave them every time we moved because i put them right on the wall. 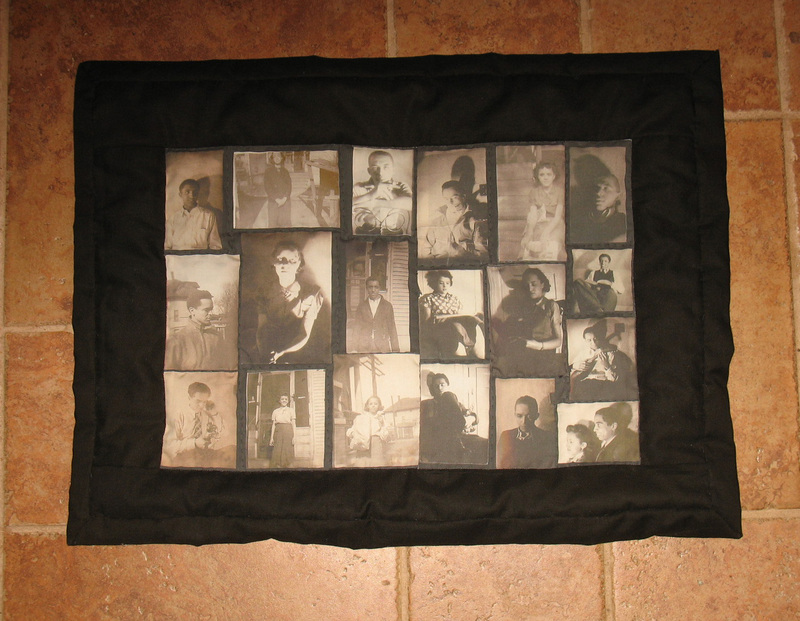 I had never heard of photo quilting until you posted an early SS post on this. I have no idea how this is done but it certainly would be lovely to have. I really like seeing all of your quilts. I remember the photograph one from a previous blog. What a terrific post and love how you have showcased your creativity. 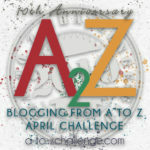 The perfect venue to let you know that I have nominated Finding Eliza to receive the One Lovely Blog Award. Stop by my blog page and pick up your award. Congratulations – I look forward to many more creative posts! What beautiful quilts! Thanks for sharing.